You’re coughing, your nose is running, and you are feeling congested. You might think you have a cold, but you may actually be dealing with an allergy. They can be difficult to tell apart. Many people are surprised to learn that they share several symptoms, and knowing which one you are afflicted with can help you choose the correct treatment. With both colds and allergies, you may have sneezing, a runny nose, and feel congested. While you may have throat pain with either, if you have an allergy your throat is more likely to feel scratchy than sore. You may also experience coughing with either a cold or allergy, but this is far more common with a cold, and a cough from a cold will be deeper in the chest. Itchy, watery eyes and itchy ears are common features of an allergy, but are almost never seen with a cold. The most distinguishing symptom, however, is the presence of fever and/or body aches. If you have either of these, you are definitely fighting a cold. Allergies do not cause fevers or an aching body. Another way to figure out if whether you have a cold or an allergy to something is to see how your symptoms respond to treatment. You can try taking an over-the-counter antihistamine to see if your symptoms diminish or stop altogether. If this works, then you have an allergy, as a cold would not respond to these medications. In fact, if you have a cold, there is nothing you can take to make it stop because a cold is virus that must run its course. You can only try to ease some of the symptoms by taking over-the-counter cold remedies or targeted medications to alleviate specific symptoms (such as acetaminophen or ibuprofen for aches and pains). Another treatment to test would be to try to remove the source of potential allergens. Avoid the outdoors in the morning as much as possible, because pollen counts are at their highest then. Keep pets and plants out of your bedroom. And, finally, try showering at night to remove pollen from your hair and body. If any of these helps with symptoms, then you have an allergy. The surest way to tell the difference between the common cold and an allergy is the duration of the symptoms. Even though there is nothing you can do to stop a cold, you will probably only suffer from it for about ten days at the most. If your congestion and runny nose last more than two weeks, you have an allergy. 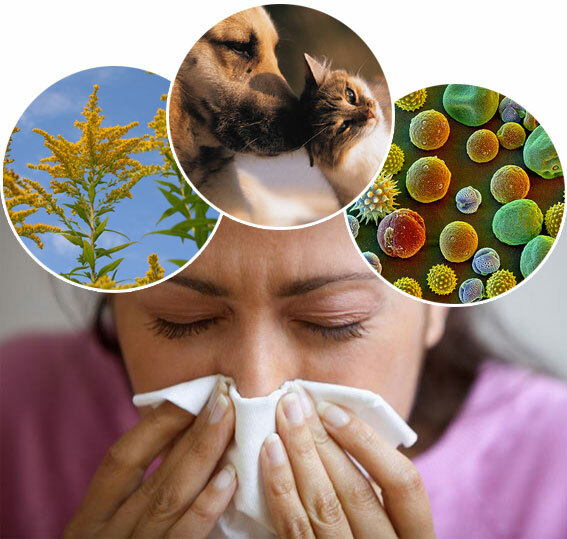 Colds are relatively short in duration, while you can experience allergy symptoms for months. If you’re still not sure, or your symptoms are unbearable or unresponsive to over-the-counter treatments, try talking with your doctor. There are prescription options available that may help you deal with your allergies, and there may be a prescription medication that can help alleviate the symptoms of a the worst cold, even if they can’t cure it.